Whether the result means that Barça have gained one point or dropped two is a matter of opinion after a dramatic lunchtime encounter on Sunday ended 1-1. 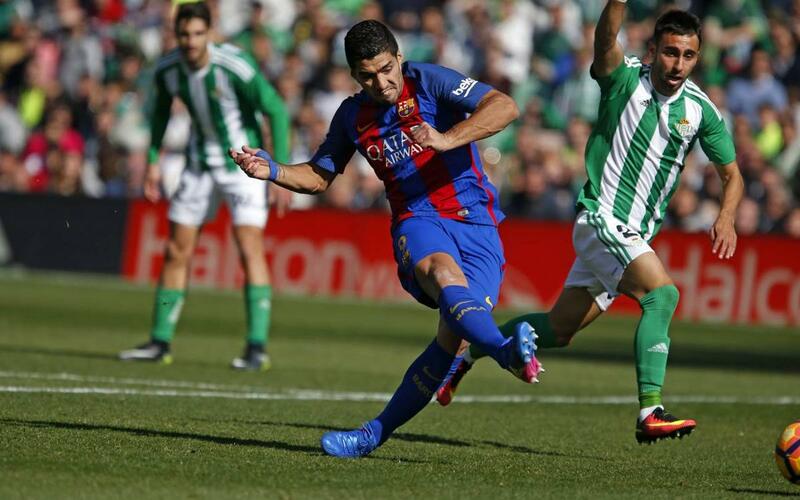 Betis have yet to lose at home under Victor Sánchez and today we got to see why, but right at the final gasp Luis Suárez made sure the Catalans at least got something out of this game. However, the role of goal-line technology in football will be a much-discussed topic in the bars of Barcelona for the rest the day. And probably most of the week. Certainly once, and maybe twice, the Barça equaliser could have come much earlier had hawk-eye have been allowed to watch. The vociferous Benito Villamarín supporters were loving it, but Barça never fully settled into this game. Despite their defence-orientated 5-3-2 system, the Andalusians made it clear right from the kick-off how strong they are on the counter attack. And a series of uncharacteristic errors in the Catalan ranks gave the home side far too many chances to make that apparent. Ter Stegen was only really tested once in the first 45 minutes, diving splendidly to detain a Dani Caballos strike. But a disturbing amount of the key action was in the direction of his end of the field. Betis were the better side in the first half, but for all their efforts they had created little in the way of real danger. And as long as they didn’t score, it always looked to be a case of waiting until Barça finally switched on the magic. That looked to have finally happened in the 38th minute when Neymar Jr was through – but home stopper Antonio Adán managed to palm away an otherwise certain goal. There was a new intensity to Barça’s play after the break, and Aleix Vidal very nearly turned that into a goal. But Betis continued to cause problem after problem and Ter Stegen continued to be far more active than Adán. The German goalie was providential against Álex Alegría and twice required medical attention as he ensured the game remained goalless. And still Betis pressed. Caballos thundered the ball onto the bar on 70 minutes, moments later Rubén Castro hit the post and Barça were frankly fortunate not to be behind. But their luck ran out in the 75th minute – a corner floated in and a mad scramble saw Alegría somehow got the ball over the line. 1-0 to Betis. The goal finally brought Barça to life and straight from the restart came the moment that pundits will be discussing for days, when Aleix Vidal’s deflected cross bounded down off the bar and was then cleared off the line by Aissa Mandi. There’s no goal-line technology in La Liga and the replays showed that not only was the ball over the line when the Algerian’s foot met it – it was at least a foot over! To rub salt into the wound, Suárez looked to have a valid penalty claim too.. If that wasn’t frustrating enough, there was a similar incident mere moments later where another Mandi clearance may also have been a split second too late. The game was electric now. At the other end Ruben Castro was through one-on-one with Ter Stegen with all the time in the world, but the German capped a brilliant 90 minutes with another terrific piece of goalkeeping. Just when it looked like Barça would be travelling home empty handed, up stepped Luis Suárez. Leo Messi threaded the deftest of passes straight to the Uruguayan’s feet and a late point was salvaged. It had been a frustrating day out in Seville. Given the balance of the teams on the field, a point might have been a fair result. But the fact that the blaugrana were denied one, maybe two, legal goals does leave a rather nasty taste in the mouth.